It was Super Bowl Sunday. I had just dropped the family off at the airport for a quick getaway to Florida to see Nana and Grandpa. The first thing I did was head to a brewery. I enjoyed a couple of quick beers at Wax Wings Brewing Company on Gull Road but still needed to grab dinner on my way home to watch the game. I pass several pizza places so I made a phone call while sitting at the bar to place an order. I picked Frosty Boy Ice Cream, Pizza, Subs, and More because I was curious. For as long as I can remember, Frosty Boy had always been co-branded with Cottage Inn. We’ve been there a few times for ice cream but had never gotten a pizza. We have Cottage Inn on our side of town and didn’t need to go out of our way to get one. Frosty Boy is in the Burke Acres Neighborhood on the northeast side of Kalamazoo. The building on Gull Road is quite substantial for either an ice cream place or what is mainly known as a carry-out/delivery pizza place. The interior of the building hasn’t changed in the switch from Cottage Inn to an in house pizza place. 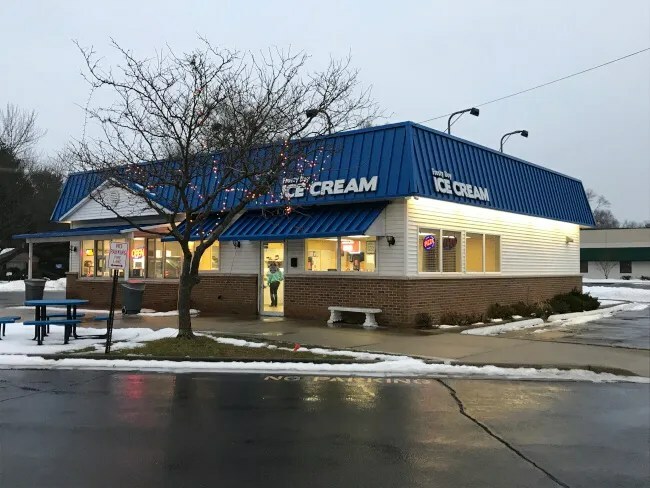 Ordering and pickup is still done at a small counter separate from the ice cream part of the building. There is a small dining room off to one side. 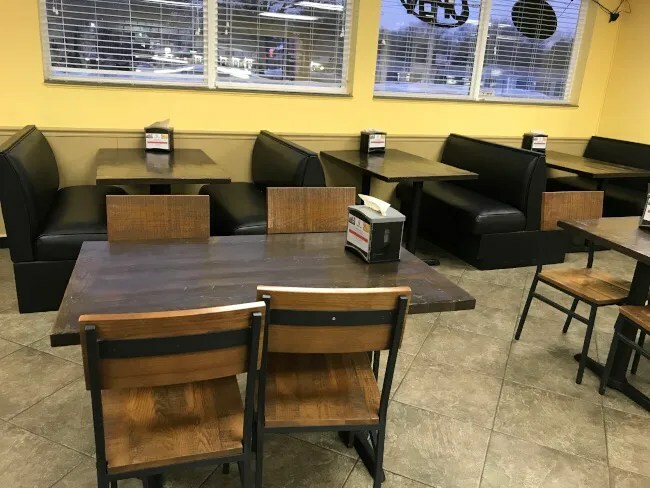 There are just a few tables and booths that look like they were recently installed. I got the restaurant a little early. 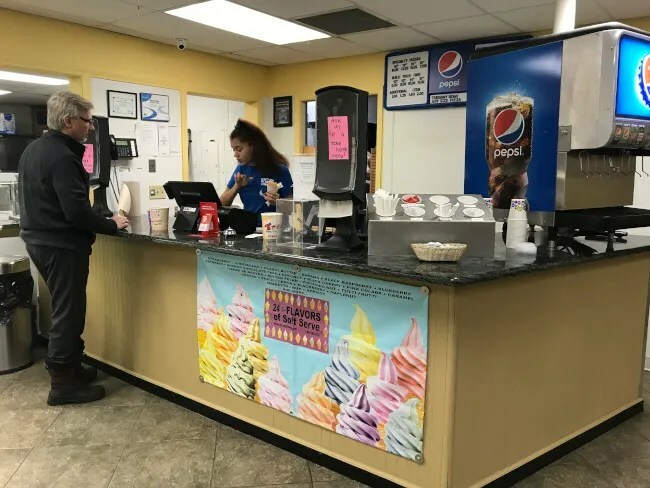 The lone employee working the counter was right in the middle of getting ice cream for a couple. She stopped doing that and came over to take care of me. I questioned her stopping helping the other couple but she said it would just take a minute. She was having trouble getting my credit card to run so it took longer than expected. The couple waiting on ice cream left. I felt really bad that she abandoned them and should have pushed a little harder for her to go back to the couple she was dealing with when I walked in. It took a few minutes for my credit card to go through for some reason and there was still about five minutes left on the cook time once it finally did. I sat down at a table and waited for my name to be called. 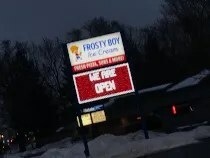 I stopped at Frosty Boy because I was curious to see if they were just trying to replicate Cottage Inn without having the franchise. When I opened the box, I could clearly see that was not the case. I ordered a 14″ thin crust All Meats pizza. The pizza is a fairly thin crust cut in to triangles (Cottage Inn does their thin crust in squares). 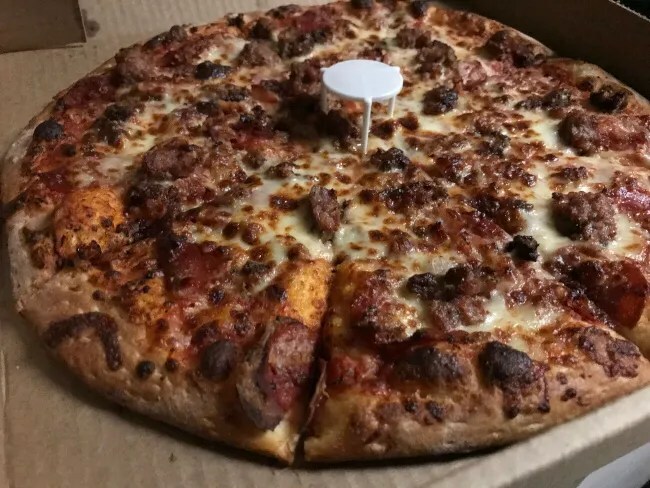 It’s topped with a slightly sweet sauce, a decent layer of cheese and pepperoni, ham, Italian Sausage, bacon, and ground beef. 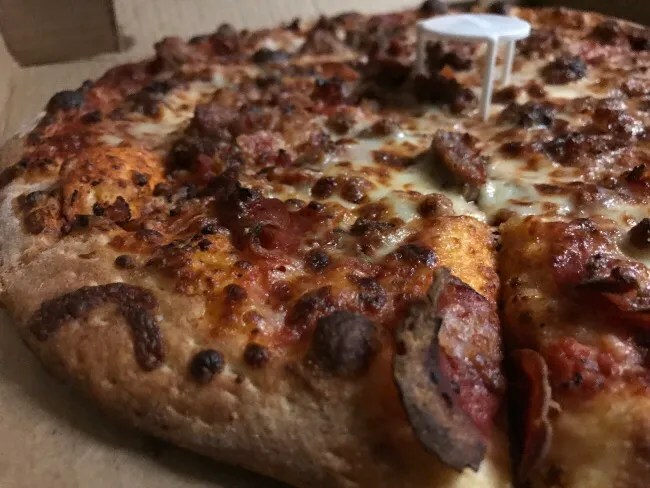 Frosty Boy’s pizza is actually really good. I might even prefer it over Cottage Inn. The abundance of meat gave the top a little bit of a greasy sheen but it was a very tasty sheen. The damage was a little over $16 and I got home just in time for kickoff of the Super Bowl. I gotta say, I really enjoyed this pizza and it’s not at all what I was expecting. A lot of times when places drop franchise agreements, they continue making the same food without expense of the franchise. That is not the case at Frosty Boy. They’re turning out a different product and one that really hit the spot as I was watching that awful game.